After spending two days attending educational sessions and visiting with equipment and service suppliers on the trade show floor, you’ll want to make sure that you schedule time for some networking and relaxation at the IAOM Golf Tournament at the Riverdale Golf Courses in Brighton, Colorado. The scramble will start at 8:00 am at the Riverdale courses, followed by lunch, awards and hole prizes. A traditional park-style layout, but crisscrossed by canals, The Knolls has plenty of hazards, trees, and features many elevated greens. Don’t take this course lightly – good course management is in order here! All golfers must register in advance for the tournament. Sign up before March 12 and pay $90; after March 15 it’s $100. 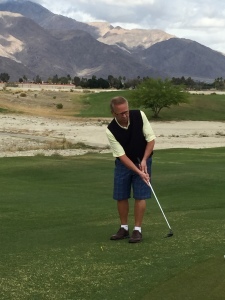 Be sure to indicate your handicap or 18-hole average on your reservation form. Team groupings should be sent to David Byers at david.byers@ardentmills.com. Registration fee includes breakfast, green fee, cart, range balls, lunch and prizes. Those participating in the Spouse/Guest Program at the Annual Conference & Expo will experience two days of fun and excitement. After breakfast at the Hilton Denver City Center, attendees will wind their way to the top of Lookout Mountai n while enjoying the breathtaking views along the way. This 7,377 foot peak (2,250 meters), located just west of downtown Golden, is known for its natural scenery. Though its earliest known inhabitants were the Ute tribe of American Indians, who used the mountain as a lookout point for the surrounding region, the summit is also famous as the gravesite of William Frederick “Buffalo Bill” Cody. 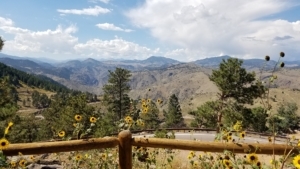 After a scenic drive down the mountain, the motor coach will bring you to the Table Mountain Inn where you’ll feel the spirit of the West, the splendor of the Rocky Mountains, and warm western hospitality in an adobe-style boutique hotel. Upon arrival, you’ll be treated to a delicious lunch buffet in a beautiful setting. There will be time for a little retail therapy in Golden at this stop as well. acoustic marvel. The incredible view and wonderful sandstone formations will take your breath away! Once you’ve taken in the beauty and wonder, visit the Red Rocks Visitor Center and learn about the history of the area. 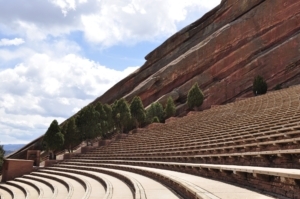 The center features an interactive Performers’ Hall of Fame that highlights the hundreds of artists who have performed at Red Rocks during its nearly 100-year history. The next day will begin with a continental breakfast at the hotel. Spouses will depart later that morning to enjoy a wine- and food-tasting experience at a local venue. Included is a tour of the winemaking facility and a presentation by the expert vintner of how wines are designed. And, to make sure there is plenty of time to get ready for the evening’s activities, the scheduled event will end around 2 pm. 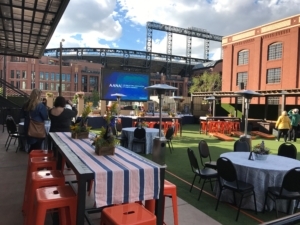 IAOM’s Allied Trades welcome the 2019 IAOM Annual Conference & Expo to ViewHouse Eatery, Bar & Rooftop, located in the ballpark neighborhood of Denver. One block away from Coors Field, the ViewHouse has one of the best views in town. The rooftop patio allows a 360-view with prime shots of the stadium and LODO. Downstairs the lodge-like tavern bar leads into the rustic-meets-industrial dining room, with elevated DJ booth (for when the room transforms into a dance club) and glass garage doors that open into the turfed courtyard, complete with volleyball net and lawn games. ViewHouse is a chef-driven, casual eatery, bar and rooftop that has a locally-rooted vibe and fun energy. It is inspired by Coloradans’ fondness of sports, love for the outdoors, and living a healthy lifestyle. 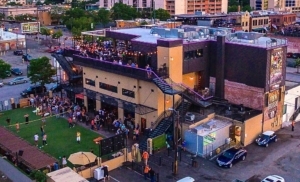 In 2014, it was named one of America’s Most Popular Bars by Foursquare. Catering to the city’s biggest sports fans, backyard game junkies and casual diners alike, you will be sure to enjoy the ViewHouse experience while in Denver! While you are mingling with other conference attendees in the huge courtyard, be sure to play some of the outdoor games on offer: volleyball, bocce ball, corn hole, giant Jenga and giant beer pong. Bus transportation will be provided between the Hilton Denver City Center Hotel and the ViewHouse from 5:30-9:30 pm. However, for those who are interested, it’s an easy, 15-minute walk from the hotel to the restaurant. Another option is to hop on the 16th Street free MallRide to Market Street, and then walk four blocks to the venue. 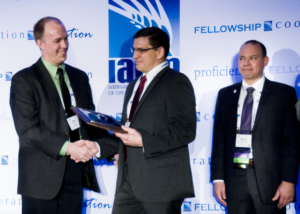 IAOM will honor and pay tribute to its award recipients at the Annual Banquet & Awards Ceremony on the final evening of the conference, April 18. It is sure to be a memorable evening. This year’s celebration will be held at the Hilton Denver City Center hotel in Denver, Colorado. The evening will start at 6 pm, with a reception, where IMEF Silent Auction bidding will continue. The virtual bidding software will allow the Silent Auction to stay open throughout the banquet. The reception will be followed by what promises to be a delicious dinner, prepared by the hotel’s talented chefs. The evening will feature a program that includes the passing of the gavel, presentation of IAOM awards and a live auction to raise funds for the International Milling Education Foundation. Advance tickets are $85 and may be purchased through IAOM during registration. Tickets purchased after the early-registration deadline of March 15, will be $95. IAOM’s Annual Banquet & Awards Ceremony is always a highlight of the Annual Conference & Expo. Be sure to attend to see who will receive this year’s industry awards. 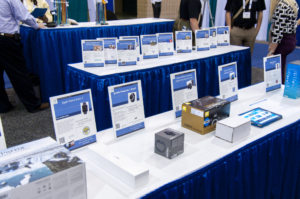 Auctions to support the International Milling Education Foundation (IMEF) will be held during the annual IAOM Conference & Expo. Auction activities have become a favorite tradition at the event! Past items have included iPads, hunting and fishing trips, electronics, golf range finders, smokers, sieves, tickets to college and professional sporting events, TVs, coffee brewers, getaway trips to exotic locations, handmade quilts, and much, much more! The Live Auction will take place during the annual banquet and awards ceremony dinner at the 123rd Annual IAOM Conference & Expo in Denver, Colorado, on the night of April 18. An auctioneer will be on hand to keep the bidding interesting and make sure everyone has a shot at the fabulous items on the sale block. This is your chance to bid on once-in-a-lifetime experiences for you and your friends. We should warn you now, the live auctions are both fun and exciting. Possible side effects may include satisfaction, a sense of purpose, exhilaration, elevated heart rate, laughter, giddiness, sore cheeks from smiling, and a sore shoulder from raising your numbered paddle and waving it around frantically trying to outbid that guy over there. Stretching beforehand is a good idea. How good are you at guessing Heads or Tails? If you win the Heads or Tails game at the banquet, you will win your choice of any of the Live Auction items prior to the first bid. In order to participate in the Heads or Tails game at the banquet, you will need to purchase a set of beads that will identify you as a PLAYER. The purchase price for one strand of beads is $100 – and only 100 beads will be sold. If all beads aren’t sold prior to the beginning of the game, it’s possible the remaining beads will be sold to a PLAYER who wants a second chance at winning. With the Silent Auction taking place via mobile app, it’s not even necessary for you to be present to participate in the Silent Auction bidding, which opens on Wednesday, April 17 – auction previews will be published prior to the conference – and ends during the banquet. Our totally Silent Auction caters to an even stealthier crowd. Our extensive auction catalog is a veritable treasure trove of coveted objects, services, and experiences—with 100% of proceeds benefiting IMEF. With every dollar you spend helping IMEF, we encourage you to let loose your competitive spirit and generous nature to top that last bid!